June 9th was Bill Maher’s first time back in front of his “Real Time” audience following his use of the n-word the previous week on the show. He used his airtime time wisely. Not only did he sincerely apologize, more importantly, he invited progressive activist Symone Sanders, rapper, actor, producer Ice Cube, and Georgetown professor Michael Eric Dyson to re-educate him on why the word’s usage is, and always will be, offensive to Black America. Um, what did you say, Bill? Who better to school Maher than Ice Cube, who came to fame as a member of the legendary hip hop group N.W.A (short for N***** Wit Attitude), and who’s lyrics are laced with the N-word. “That’s our word now, and you can’t have it back,” he told Maher. Some things just ain’t funny. This is real right here, that we’re [African-Americans] going through. I’m not trying to get on your case, Bill. I like your show, I like you, but I do think this is a teachable moment not just for you, but to the people that are watching. Cube: You got a great show, but you be bucking up against that line a little bit. Cube: “Nah, sometimes you sound like a redneck trucker up here . . . a little bit. Ok, so the leading voice of the progressive, liberal left, Bill Maher, can’t understand why Ice Cube feels he sometimes comes off like a redneck in a trucker hat. Bill, there are moments, when people of color see you wearing an invisible red trucker hat — even if you don’t realize you’re wearing it. When you invite Ann Coulter and Milo Yiannopoulos to your show, you go out of you way to soften them to your viewers. They are two of the most vile, race-baiting, imbeciles on the Far-right, who bring no intelligent discourse to the table, yet you make sure to soften the blow of Ann’s rabid comments with “but she’s a great friend of mine,” and you try to downplay the effect Milo has on his targets, who are mostly people of color and women, by infantilizing him as an “annoying little brother” and “harmless” and “bratty”. Bill, why would people of color not dislike someone who vilifies their existence? 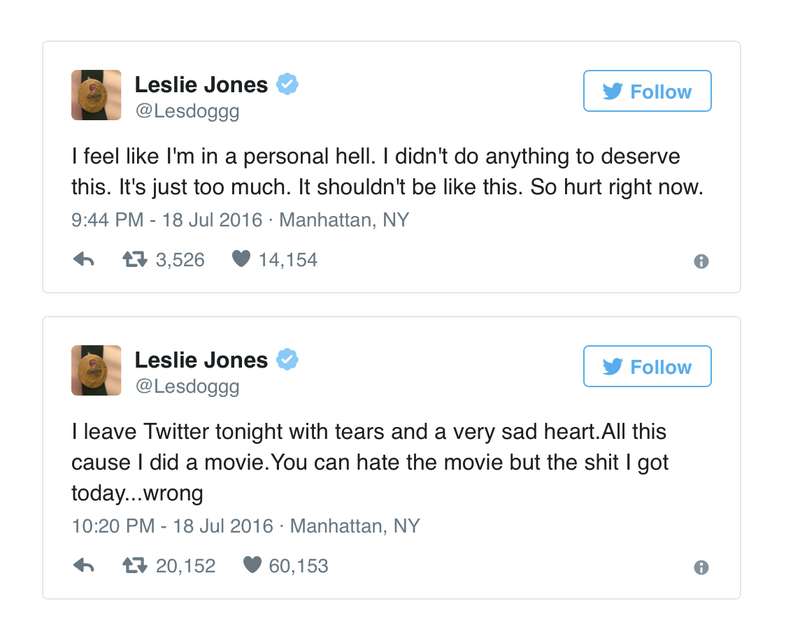 Can you tell African-American actress Leslie Jones that Milo is like her impish little brother who retweets racist, humiliating, sexually explicit, repulsive tweets fabricated to look like they were sent from her, where he called her illiterate, and she was portrayed as an ape after he spearheaded a wave of racist abuse, including the hacking of her website to expose her personal information? You never took him to task on this—and God knows you know how to take people to task. You just buddied up with him and tried to find common ground while complaining about PC culture and other people’s oversensitivy. He became you’re little brother, not ours. At the roundtable, Milo reiterated a lie that Leslie Jones can barely spell (because she’s black) and then insinuated the African-American guests, Larry Wilmore, former host of “The Nightly Show” and Malcolm Nance, a renowned national security and counter-intelligence expert “were stupid”. So Milo is the “opposing view” and “free speech” worthy of your show? When Harvard professor Cornel West was on your show recently, he gave you a simple answer. You told him it was “glib” and “beneath you as an intellectual” and demanded more from him, but you give Milo a rare a one-on-one interview AND then a place on your roundtable when the best intellectual prowess he’s got is a fifth-grade mentality of pointing at people and telling them they’re “stupid”—because they’re black? When you try to bring your loyal audience a sense of kindred commonality between you and Ann “equally” having trouble with UC Berkeley, defending her after the university cancelled her speaking engagement, implying that the cancellation was because overly sensitive liberal students can’t handle conservative speakers who don’t offer opinions and ideas that vibe with their sentiments and POVs. Ann Coulter is NOT a conservative speaker. She is racist-extremist who spews ignorant hate speech that is not worthy of intellectual discussion and debate on a university campus. I don’t expect UC Berkeley, my alma mater, to tolerate a nouveau Archie Bunker spewing uneducated rants on the campus. Archie Bunker in heels and a skirt is still Archie Bunker. 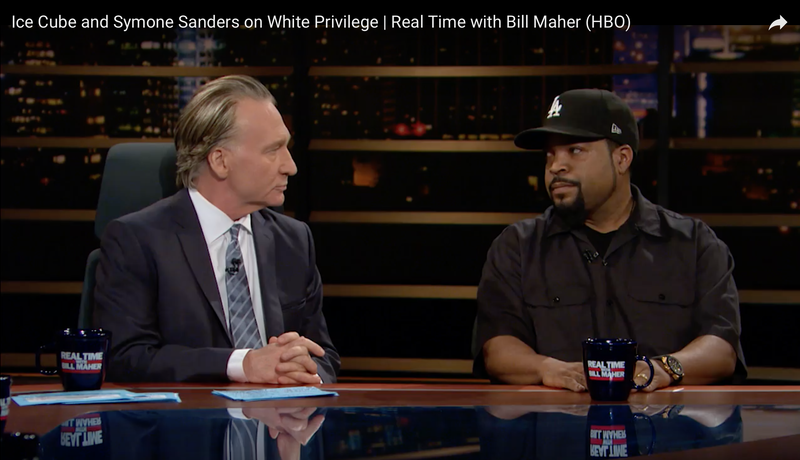 Ice Cube’s expression is every person of color each time Bill Maher gushes over his best-friend-forever-race-baiter-by-day-super-awesome-person-by-night Ann Coulter. In one of your recent monologues you couldn’t understand why people couldn’t listen to opposing views or just “evolve”. You used the word “evolve“? Why do you have people on your show who are un-evolved and offer no evolution of thought or ideas to your audience? You bring Ann and Milo to your show under the guise of “listening to opposing views”, but these two aren’t bringing smart, spirited debate — they are the Breitbart comment section personified, and you’re giving them a prestigious HBO platform that helps them continue to be a plague on the world. By softening, or infantilizing them, you implicitly expect your audience of color to have a softened view as well. We do not. We will not. It’s not about blame, but it’s for you, Bill, to understand why you, at times, come off as racist sympathizer. Ironically, Sanders comment would be better attributed to the other Bill, as in O’Reilly, who never, ever apologizes for his veiled or overt racist or sexist comments. O’Reilly was probably a slave master in a past life, or at least, he nostalgically fantasizes about the old South. To be fair, not all white people in America owned slaves and not all white people believed in the institution of slavery, hence, the American civil war. It’s safe to say that had Bill Maher lived in 1860, he would have been a Union soldier, fighting to end slavery, loyal to United States constitution and President Lincoln. In the end, we have to commend Bill for being cool about this. We need to commend him for bringing Symone Sanders, Ice Cube and Micheal Eric Dyson to the table. He’s evolving just like everyone else. After all, he could have apologized and seamlessly moved on to the red-hot Comey-hearings topic, but he didn’t. He dedicated his show to learning and evolving. Fellow progressives, we need Bill Maher’s voice more than ever. He’s not perfect. We cannot demand that our leaders and influencers on the left be perfect, just that they be flexible enough to evolve and listen. Bill Maher has always been progressive, intellectual, and truthful—with faults—like all of us. His intentions are not laced with malice, and I think all progressives who know him well enough believe this to be true — that’s why Ice Cube quickly accepted his apology and treated this as “teachable moment”. Bill been a fierce defender of President Obama since day one, donating $1 million dollars to his campaign. But he made a mistake, and like many other non-blacks, he needed to be re-educated, but the complexity of his lack of awareness needed to be broken down logically, after the emotions calmed down. Remember when self-righteous voters expected Hillary Clinton to be perfect, or else they couldn’t bring themselves to vote for her? She was evolving and compromising, but it wasn’t good enough for many of the left — she had to be perfect or nothing. Well, that immature, unrealistic demand for perfection got us Donald Trump in the White House, winning with a measly 70 thousand votes that liberals couldn’t make up . 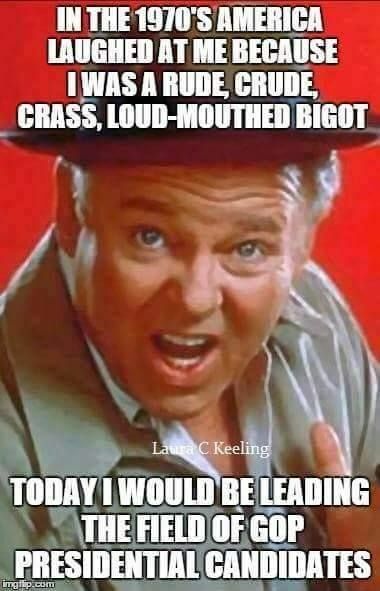 . . because right-wingers don’t demand perfection — they’re fine with Archie Bunker reincarnated. Remember this in 2018 and 2020. We cannot afford to loose Bill Maher, too. Do not shun him, and do not call for his firing. Let’s help him evolve as he has helped us evolve for the past 20 years.